Taxi booking firm Uber has completed the latest stage of a fundraising, valuing the fast growing business at $40bn (£25.5bn). The San Francisco company has raised another $1.2bn from investors in a deal that confirms its status as one of most highly valued new technology start-ups. In June, a sale of shares to investors valued Uber at $17bn. In a blog post on Thursday, Uber's co-founder Travis Kalanick said the new money would help expansion in Asia. The company, which a year ago operated in 60 cities in 21 countries, is now in 250 cities in 50 countries. 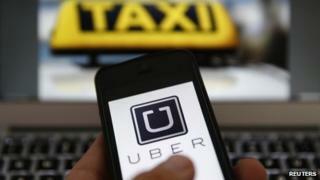 At its current valuation Uber, which was only founded in 2009, is worth about three times as much as either ITV or Marks and Spencer, says BBC technology correspondent Rory Cellan-Jones. Last month, the company was forced to issue an apology after being accused of planning smear tactics against journalists and of tracking its users without their permission. In his blog, Mr Kalanick said: "Events of the recent weeks have shown us that we also need to invest in internal growth and change." "Acknowledging mistakes and learning from them are the first steps," he added. Uber does not own cars or employ drivers, but connects customers and vehicles through its app, bringing what the company says is much needed competition to the taxi industry. But it has faced opposition from some governments and established taxi firms, including from London's "black cab" drivers and in cities across Europe and the US. Uber is also facing increased competition. On Wednesday, Softbank announced it had invested $250m in GrabTaxi, a service in Southeast Asia. Details of Uber's new investors were not disclosed, although previous backers of the business include Goldman Sachs, Google Ventures, Blackrock, and Amazon's founder and chief executive Jeff Bezos.